The waters around Cornwall have a rich wildlife heritage including Basking Sharks, Blue Sharks and Atlantic Grey Seals. As a WiSe (Wildlife Safe) Master accredited operator we have received instruction in species identification, life history and behaviour of a range of species that we might encounter, and will record our sightings for use in basic scientific research. WiSe operators have to complete a course led by marine wildlife experts before receiving Accreditation, and, have agreed to abide by the Codes of Conduct for each of the species covered within the WiSe scheme. The second largest fish in the world, the Basking Shark, is a common visitor to Cornish waters. Not long after the Plankton Bloom around May/early June they start appearing. These huge fish can be spotted by their fins and nose which just break the surface when they’re feeding. 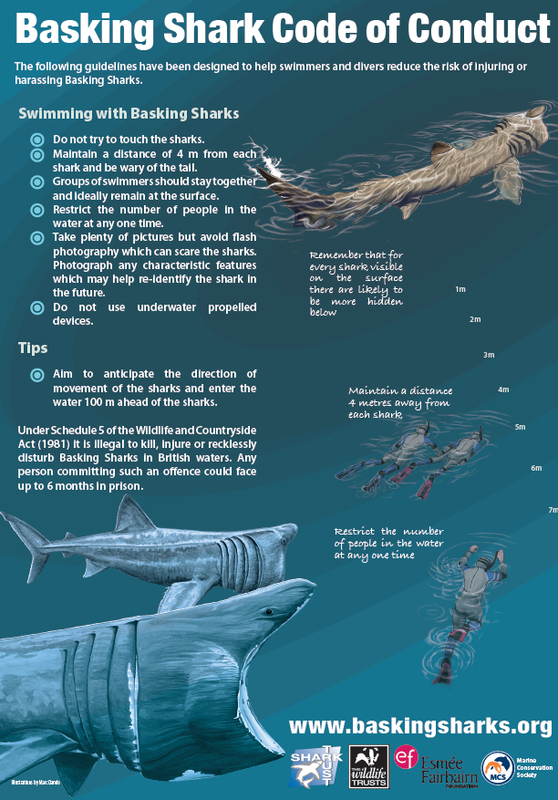 Basking Sharks are a protected species and must be observed from a distance, if you decide to enter the water you must follow the code of conduct. For information on Basking sharks read the Basking Shark Fact Sheet. 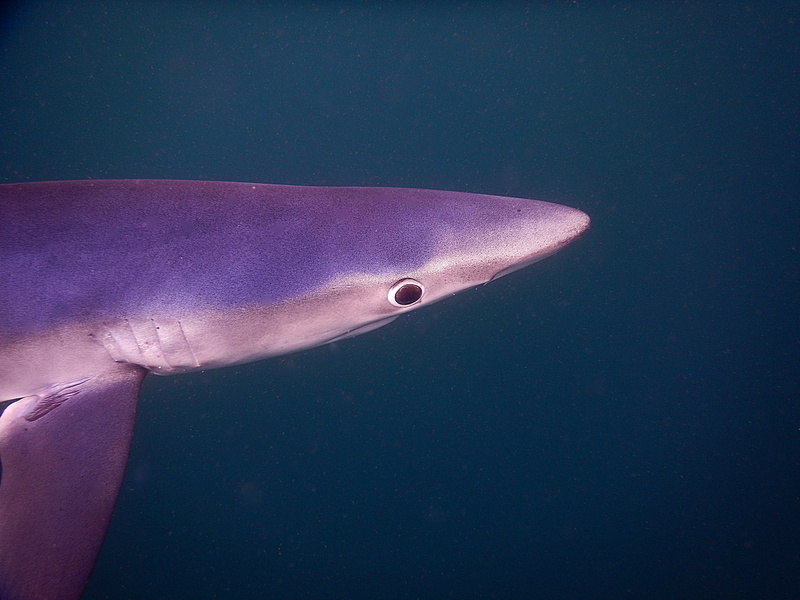 Blue Sharks appear later in the season, usually around August and September. Moonshadow is the ideal vessel to travel out to see these inquisitive fish. We have to travel quite a distance to see the Blue Sharks, with Moonshadow’s facilities, this can be done in relative comfort. A full day is recommended, although a 5 hour trip can sometimes be enough. As well as Basking Sharks and Blue Sharks, we may also come across Bottlenose Dolphins, Common Dolphins, Atlantic Grey Seals, Porpoises, Sunfish and possibly even Pilot Whales. In the past we have come across Orcas and Minke Whales but these are very rare in deed. We only offer wildlife trips as a ‘whole boat’ charter. 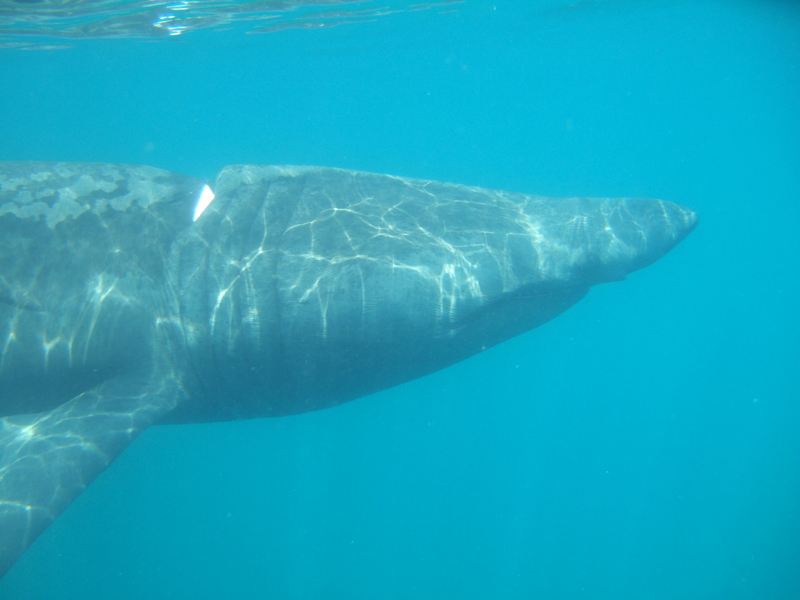 Pictures taken while snorkeling with Basking Sharks.